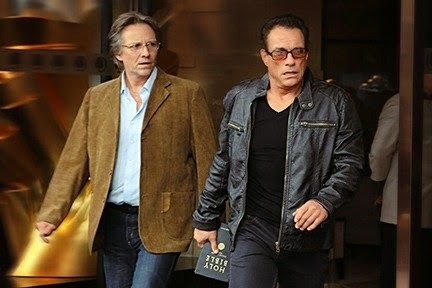 JCVD just wants his kidney back! 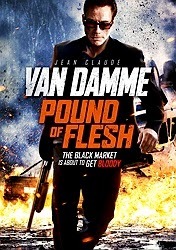 Pound of Flesh, the latest film from Jean-Claude Van Damme, is the action star's third collaboration with director Ernie Barbarash since 2011, and probably the weakest so far. Since reviving his career in 2008 with the meta action drama JCVD, Van Damme has been doing the best and most interesting work of his career. His movies aren't always as entertaining or thrilling as his '90s Golden Age stuff, but they're deeper and heavier and, most importantly, he's consistently great in them. The two Universal Soldier movies he made with Jon Hyams are among the best action movies of the 2000s, DTV or otherwise, and his bad guy turns in both The Expendables 2 and Enemies Closer elevate the quality of both movies tenfold. He's the best thing about them. His movies with Barbarash are a little different in that they're almost as much dramas as they are action movies. They are sober, somber efforts, mired in tragedies of the past and driven by haunted protagonists. It's true of Assassination Games, it's true of Six Bullets and now it's true of Pound of Flesh, in which Van Damme plays Deacon, a former soldier traveling to the Philippines for undisclosed reasons. 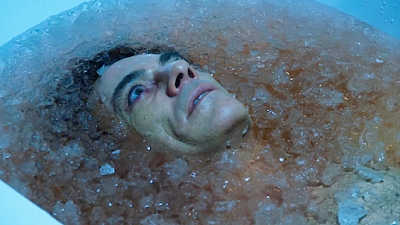 He meets a girl and sleeps with her; the next morning he wakes up in a bathtub full of ice, his kidney having been cut out of him while he was unconscious. He's understandably pissed, but to make matters much, much worse, needs the kidney back because it's already been spoken for by his niece, who lays dying in a Manila hospital. Between his niece's worsening condition and his own blood loss, the clock is ticking on Deacon as he tears through the city's criminal underworld making everyone pay. Van Damme's is a career in three distinct acts. The first was his theatrical heyday, which encompasses most of his best-known efforts and are the films which made him an action superstar. The middle act is the DTV era (era), when his movies were largely being made for overseas audiences and which run from pretty good (Wake of Death) to the truly miserable (Derailed). It seemed as though that would be his lot for the remainder of his career until JCVD turned things around and Van Damme successfully reinvented himself. For the purposes of this piece going forward, this is the period to which I will be referring. The reasoning for this distinction is because this third act of his career carries with it very specific meta-textual baggage that makes the movies of this period better even when, like Pound of Flesh, they're just ok. This new JCVD appears to have two modes: joyous scene stealer (the aforementioned villain turns, as well as the comedy Welcome to the Jungle) and self-flaggelating mope. The latter JCVD -- the one who has shown up in his three films with Barbarash -- seems to be doing penance for past transgressions. And Van Damme has a lot of transgressions both personal (including infidelity, multiple divorces and a drug problem) and cinematic (have you seen Street Fighter?). He has the saddest eyes of any action hero and, unlike his #HeavyAction contemporaries, Van Damme is not trying to hide the miles his weathered face has on it. So when he plays a character in Pound of Flesh who, we're told, was once an incredible badass but who did some very terrible things, there's a biographical aspect to the role of Deacon that grabs my interest much more than when Steven Seagal plays the 20th variation on the exact same part in the recent Absolution. Beyond Van Damme's performance, Pound of Flesh is a bit of a letdown. It's competently made (save for a green screen car scene that's positively embarrassing and some obvious stunt doubling for Van Damme) but disappointingly low on action. There's a whole lot of religious subtext to the film; though the title is taken from Shakespeare's Merchant of Venice, the rest of the screenplay is rife with references to Christianity, from the name of Van Damme's character to the fact that for a stretch of the movie he literally carries around a bible and whacks people in the face with it. Deacon must give part of his body to atone for his sins, which is interesting in theory but becomes dulled by the bluntness with which the allusions are handled. Conversational subtlety is not the movie's strong suit, which is a problem because way too much of the movie consists of characters standing around talking. Every once in a while, though, Pound of Flesh will do something really cool to redeem itself for the next 15 minutes ("redeem itself" is an unfair expression, as the movie is never bad so much as uninspired). Deacon has an exchange with his brother (John Ralston) in which he explains the difference between being willing to die and being willing to kill for someone we love -- the former clearly being the ultimate sacrifice but the latter actually being more difficult, as it means condemning yourself to Hell for all eternity. I like that the movie makes a distinction between the two, and while it's nothing new for action movies it presents Deacon as a character with nothing to lose because he already knows he's damned. Pound of Flesh isn't really a movie about a man's quest for redemption (if it happens as a byproduct, all the better). It's a movie about a guy charging head first towards Hell. There are also very few good action scenes. Aside from one street fight in which Van Damme gets dragged alongside a car doing the splits, I can't remember a single standout sequence. That's true of most of Barbarash's action movies, though; he does shootouts much better than hand-to-hand combat, but seems more interested in people talking than anything else. His last film, Falcon Rising, was a crushing disappointment. It has that amazing title and stars Michael Jai White as a badass on the warpath, but mostly has him running around questioning people. Deacon does a lot of that, too. But he also gets to shoot some people and hit them with a bible. Watching Pound of Flesh within a week of seeing Steven Seagal's latest lazy effort certainly gives me a greater appreciation for what Van Damme and Barbarash are up to. It's not the best work from either of them, but no one can accuse them of being lazy. They're still trying to do something interesting, something mature, something with some weight. I like the way Van Damme's own career is mixing with his characters, making him a guy with baggage in his past but who is embracing that baggage as a part of who he has become. We're in what is the most interesting phase of Van Damme's career, and if Pound of Flesh is as bad as it gets we can consider ourselves lucky. Got a movie you'd like to see included in a future installment of Heavy Action? Let us know in the comments below. I know you did Universal Soldier: Day of Reckoning for Heavy Action, but I always wondered why you never did Universal Soldier: Regeneration. I love both, but they are totally different films and in my opinion, Regeneration is the best DTV action film in a very, very long time. Maybe cover that at some point?